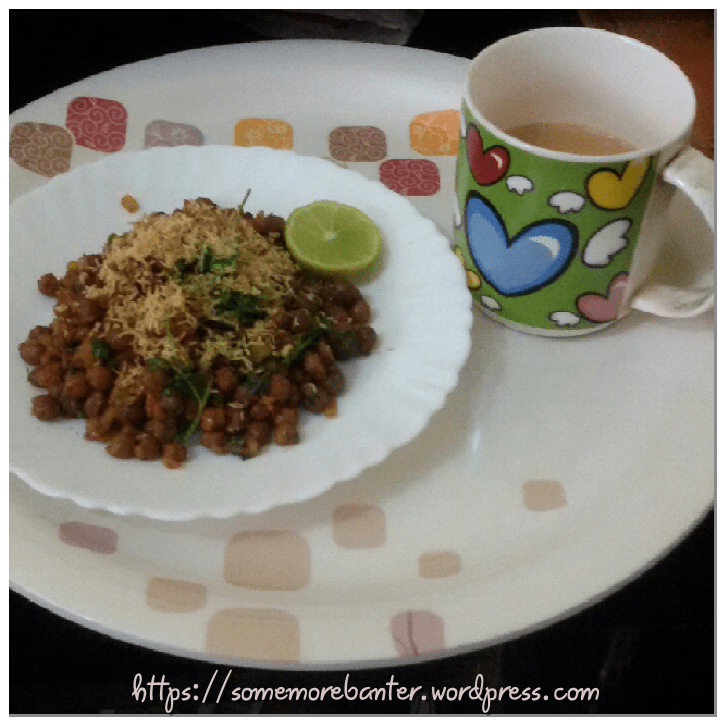 After spending the whole of this week offering suggestions that were deftly shot down even before I could finish, scampering past the limited choices over and over again a dozen times, going over the intricacies of the ease in execution etc, yesterday I and A Jr finally agreed that he will toss up his favourite Chana Masala for the Snack-making competition in his school today. I am sure your junior master chef will do great job ???? Haha…junior master chef…sounds good. He will be happy! Thanks Radhi. ???? Welcome. Let me know how it went???? Well, what’s with the secrecy? Spill the beans. Where’s the recipe?? Lol. Let the chana, onions, tomatoes, lemon juice and green chillies begin their sweet tango. Once they seem all consumed with each other let salt and chana masala waltz in. Let them hip-hop their way to ravenous tasteful glory. The final flourish…our Bollywood tadka…comes with sev, dhaniya and chat masala. Voila! Your recipe for a blockbuster! Oh wow. Totally filmy! Sounds dhamakedar alright! ???????????? Was writing something else but got a bit carried away. ???? Filmy to hum sab hain Babubhai…koi dikhata hai to koi chupata hai. ???? I hope he does well. Thanks. Nirma ad…hahaha…whatever I have to become I have to spare him for his effort though. ???? ???????????????????? Spik and span is a very far off possibility. The guy is as sloppy as they come, especially when he’s wearing a white dress. His Friday tiffin for the longest time was cheese sandwich..no ketchup. ???? ???????????????? You do? Ok, will make one for you too. ???? Good luck to the junior for the competition. Yes it is kala chana. Hadn’t made it in a while. Thanks to my son’s hankering this time! I love all kinds of sprouts. Limited protein options for vegetarians anyway. Thanks dear. So much of luck coming his way. He should feel blessed really. The recipe (if you can call it that 😛 ) is shared in a comment above. Will you take a look there? Hahaha…gurudakshina…chalo abhi ke liye udhaar rahi. ???????? Snack-making competition seems to be very much the in-thing in schools nowadays. Good that they’re moving on to get kids interested in other skills, too. Hope he was happy with what he made! Oh yes. It gets a bit messy for me but it is so much fun to get kids interested in bastions that are supposedly not suitable for them! He was happy and pleased. Thank you! Looks yummy! How did it go? It went well. Not sure he won a prize or not (not disclosed yet) but he was pleased as punch with himself for making it. So, great! ???? Arre yaar…those ads!! I show him that ad and tell him very sweetly…See if stains are good you might as well wash your clothes yourself. I’m not that Mom! ???? Hehe 🙂 those ads are good in television commercials only, not inside my too ! Glad it went well thought. Haha…yes. So misleading…as if there’s some glamour in being messy! and definitely no glamor in the job of washing too!! Definitely not! These silly ad makers make us logical and practical moms look bad. ??? ?